I began my day off appropriately studying the new book that the Magnification team at Crossroads is studying together, Sabbath Keeping. Many things jumped out at me as I began. "On that day I am a disciple, not a leader. On that day I am beloved, simply beloved." My guess is that the spirit of those who lead will respond to this statement intensely. This is what I miss so much as a leader...just being a disciple...just being able to worship not lead. I AM His beloved - I need to live as if I believe this everyday. The book says that continuous working can make us think God's love is connected to 'what I do'. 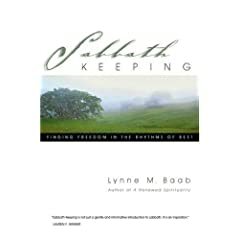 I was created with the need to organize my week so there is time to just 'be' in Him...I am so excited to study more!